Edit: Well, as you can see I posted my September challenge for Papertrey a day early! Oopsie. It's up now so I'll just leave you with some inspiration a day early. Please note that the links to the other designers' websites won't be updated until midnight tonight though. Hello again friends. I have some fun projects to share with you using Lisa Johnson's set called Flower Garden. This set has oodles of individual stamps to create endless combinations of flowers and stems and leaves. 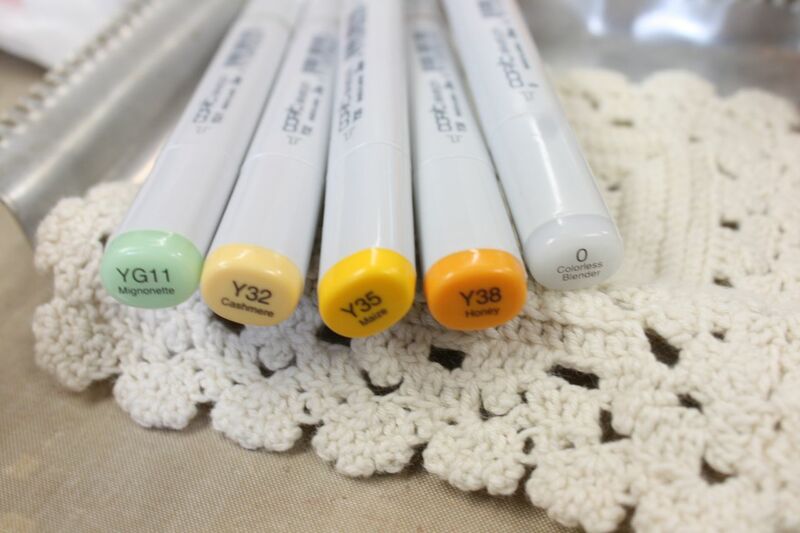 Perfect for coloring with Copics or if you prefer to stamp solid images, there's some of those too. 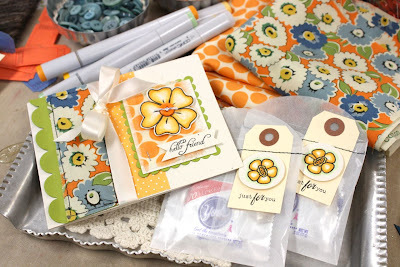 Nichole challenged the Papertrey Senior Design Team to use Flower Garden, as we are digging into our stash of some of the older stamp releases. Note: Flower Garden has a companion Flower Garden Sentiments set too. I love to be able to play with all my goodies so I challenge you to do the same. 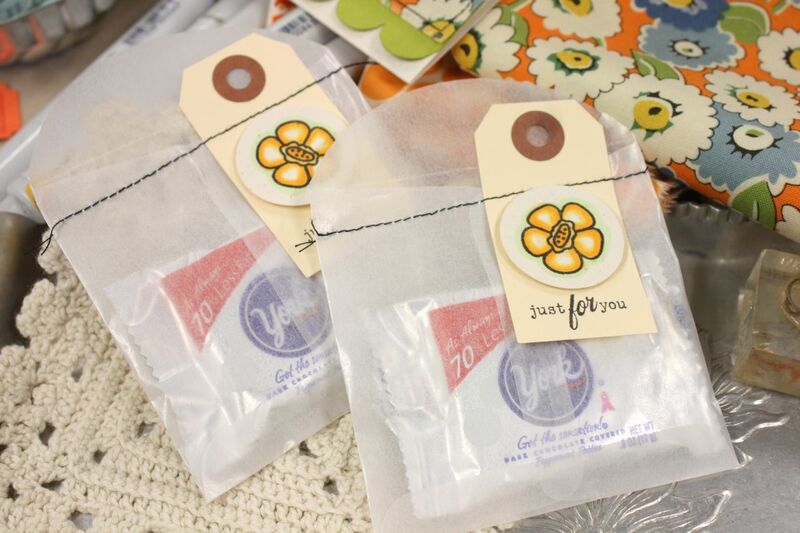 For my projects today, I created a pretty floral card and some easy treat bags. I reached into my fabric stash for inspiration for my projects. 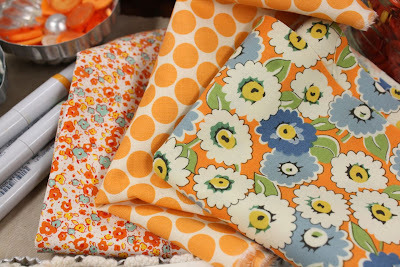 Fabrics are pretty much like patterned papers these days.....lots of patterns and florals and fun colors to select from. For my card, I used one large flower from Flower Garden along with two of the fun fabrics from my stash, some Nesties dies, polka dot patterned paper, the large PTI scalloped border die, Vintage Cream Satin Luxe ribbon and my sewing machine threaded with black thread. The flower image looks so pretty when colored with Copic markers. I colored my image and then cut it out carefully with scissors. A pretty, tied Vintage Button adorns the center of the flower. Notice how the polka dot fabric resembles patterned paper. So easily interchangeable but it gives such a nice texture to my project. For my next project, I created some treat sacks. I filled some of my glassine sacks (coming soon to my Etsy shop) with a simple York Peppermint and then stitched the bag closed with my sewing machine. 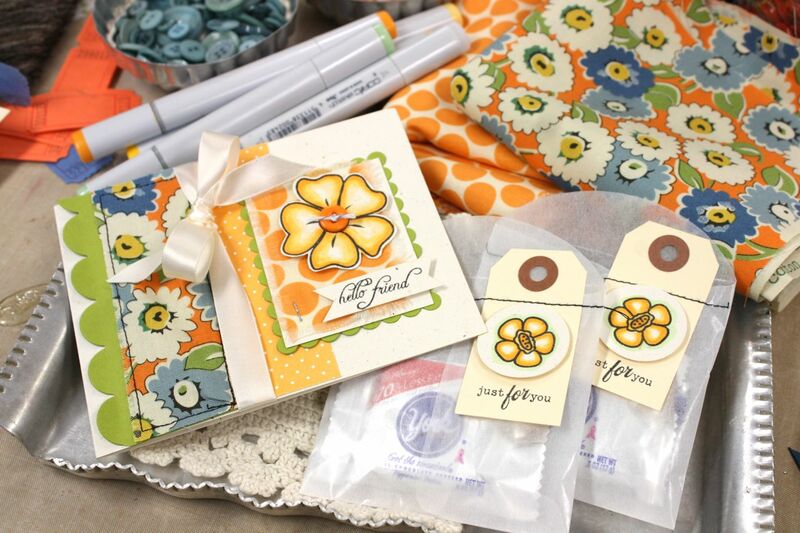 I used Small Manila Parcel Tags with punched circles on top that have stamped and Copic colored flowers. Sentiment is from Friendship Jar. I stitched right over the parcel tags, creating a fun package for the recipient to open. I'll be giving these goodies to the girls on game day for a little good luck/after school snack. 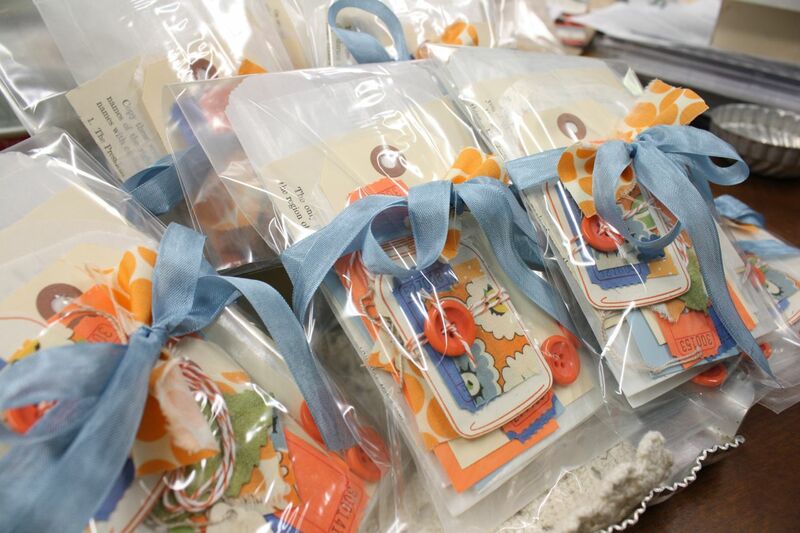 Such fun little goodie bags. Here's the Copic Sketch colors I used to color my flowers. The YG green color was only used on the goodie sack tags. Hope you enjoy my projects today! 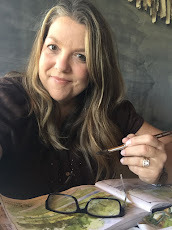 Be sure to check out the other Senior DT blogs for their cute Flower Garden projects: Heather Nichols, Dawn McVey, Betsy Veldman, and Lisa Johnson. Oh my. 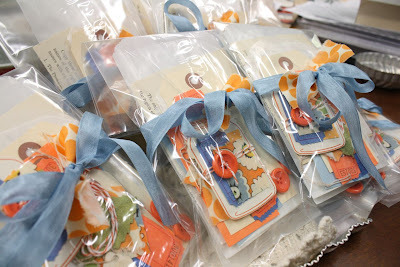 My kits are all packaged up and boy are they cute. This kit comes with oodles of packaging goodness. You'll be the first to get a sampling of some brand new items coming to my Etsy shop soon. 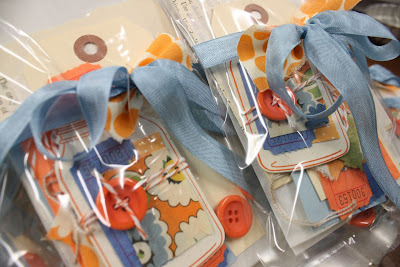 Packed full of pretty blue and orange themed goodies, you'll be on your way to packaging up some super duper cute gifts with this kit. 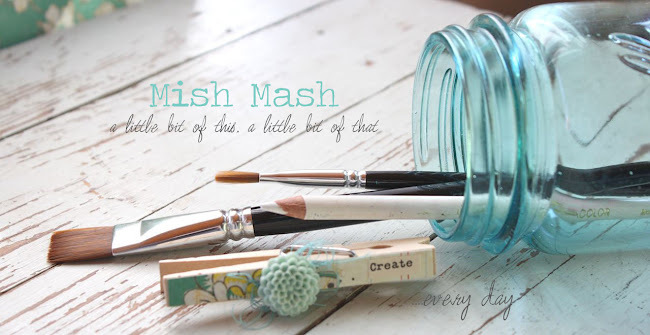 The embellished Friendship Jar doo dad really steals the show but let me show you another goodie you can make with your kit contents. 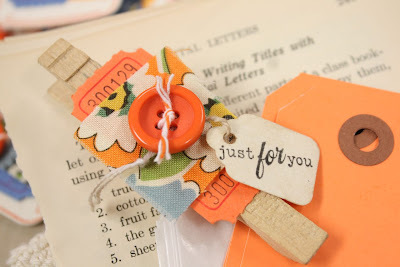 For this cute accent, I'm using one of the weathered stained clothespins, an Orange Soda Carnival Ticket, a Tiny Tag, a snippet of vintage inspired fabric, a vintage button and the orange and white baker's twine. 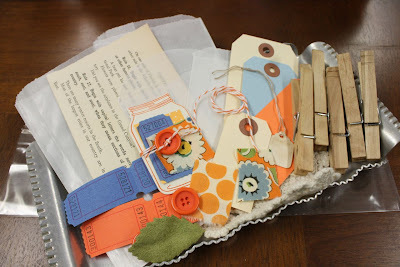 Assemble the goodies together in simple collage style, sewing the twine through the button and all layers for extra sturdiness. 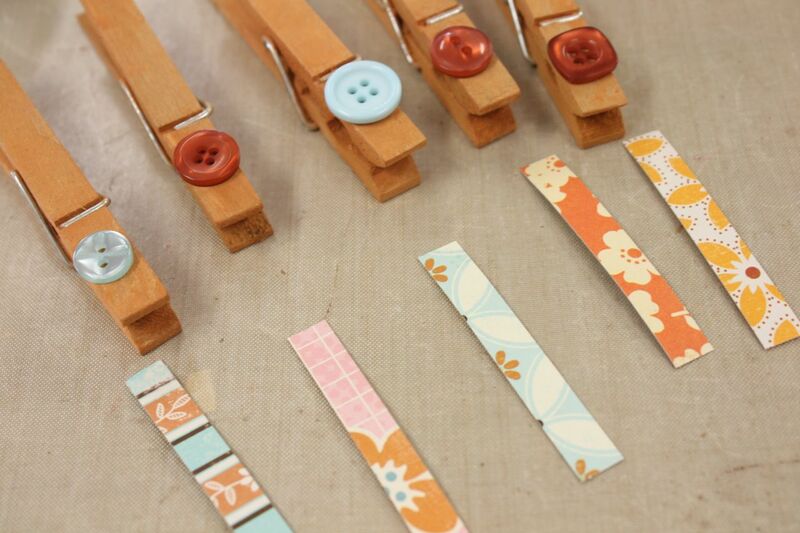 Use Scor-Tape to adhere the piece to the clothespin. 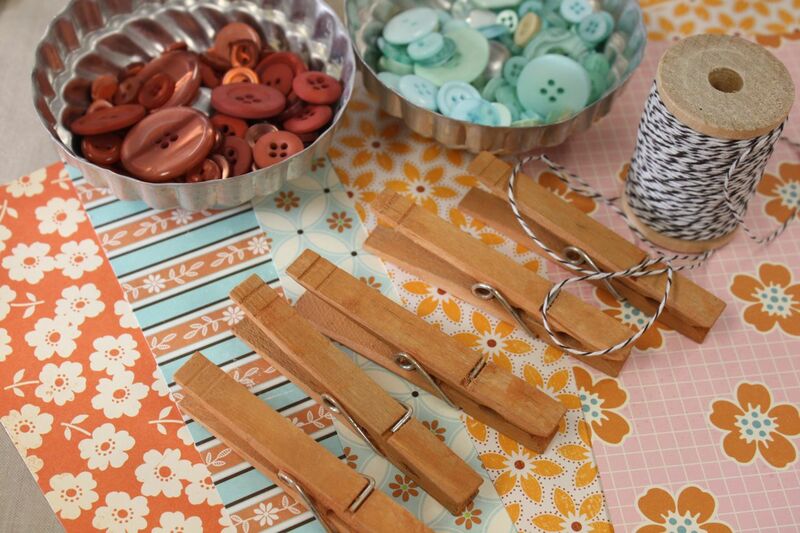 Have I told you how much I love clothespins? Oh boy, stay tuned for more colors coming soon to my Etsy shop. Drool worthy. 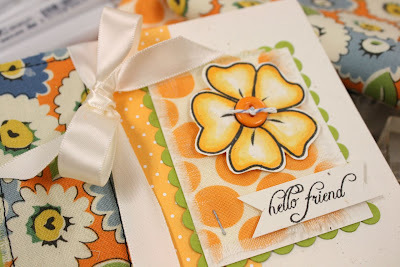 Next up, stamp a sentiment on the Tiny Tag from Friendship Jar. Wind it around the secured button for cute, dangly tag. Voila, you've now got yourself a cute clippie to attach to gifts, notes, etc. Use a tag, a glassine bag and some candies and you'll be set with some darling and inexpensive little gifts. Just look at that cuteness, would ya? Tip: No need to tie on the Tiny Tag. Just use the attached string to wind the tag around secured buttons. Easy peasy. Who wouldn't love this little gift? Here I've tucked a length of cute fabric into one of my new glassine bags that I'll be carrying in the shop soon. A-dor-a-ble. Or how about using the embellished clothespin clippie to mark your button jar colors. Oh, talk about craft room heaven. I would never want to leave. Okay, it's almost time to start fixing supper folks so let's get the show on the road. Here's what ya get in the kit. 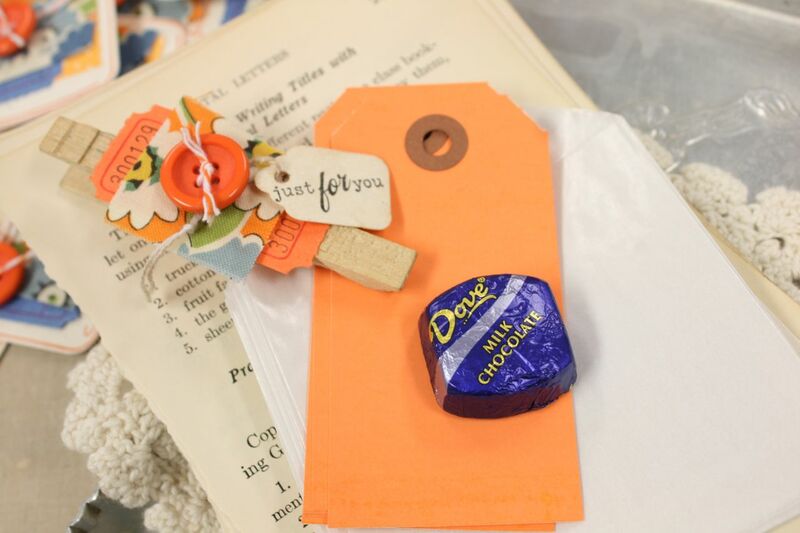 Lots of glassine bags, a clear cello bag, colored and Manila Parcel Tags, 5 weathered stained clothespins, a vintage school book page, orange and white baker's twine, 2 snippets of fun fabrics, 2 vintage buttons, carnival tickets, a Tiny Tag, a velvet leaf and surely some more good stuff. The kits are all packaged up and ready to go. Oh I love to make up these kits. It's like wrapping presents for all my best friends. They are cute peeps. Everything you get in your package is totally re-giftable. You get the kit contents all packaged up in a reusable cello bag,a pretty blue bow and a snippet of fabric. Be sure to use all of these goodies. 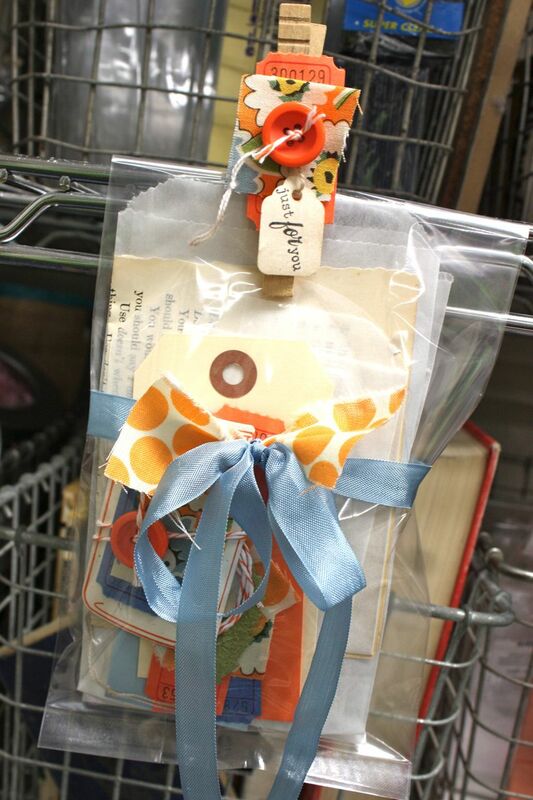 And isn't the little snippet of fabric so cute tied within the bow of the blue ribbon. I must remember to do that more often. Ahhhh, I think I might just order up all the kits and hang them in my Artsy Studio....just to make me happy. Isn't it just fun to look at something pretty. I'll be listing the kits in just a bit. Thanks for stopping by today. Hi friends, I hope you are enjoying this glorious day. I'm fixin' to can some jalapeno pepper rings. We loooove the nachos in the winter time. And why must Eric plant the hottest peppers on earth when we eat maybe one a summer? Must be a man thing and that the plant costs like 50 cents to begin with. 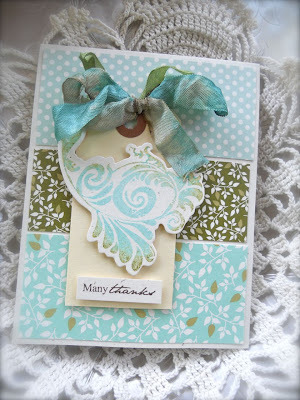 For your viewing pleasure today, I have a card I made for the Papertrey release this month to show you. 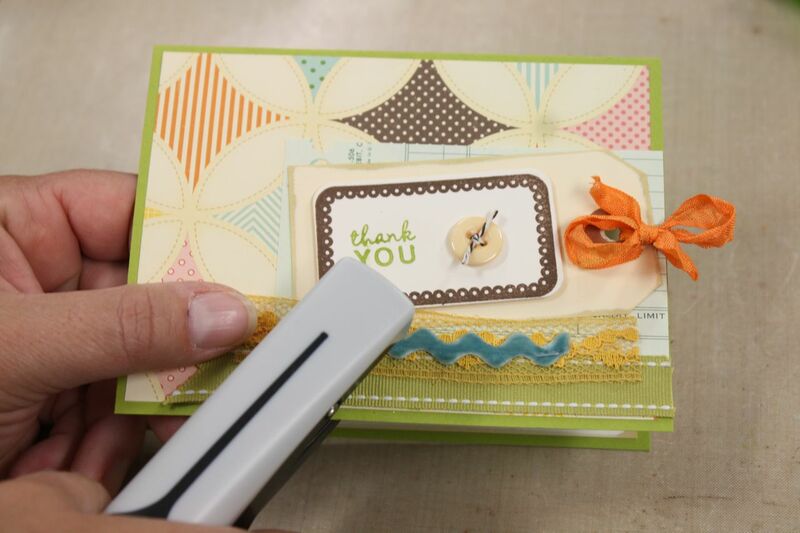 It features the new Embellishments set with matching die. Such a pretty set! Enjoy. 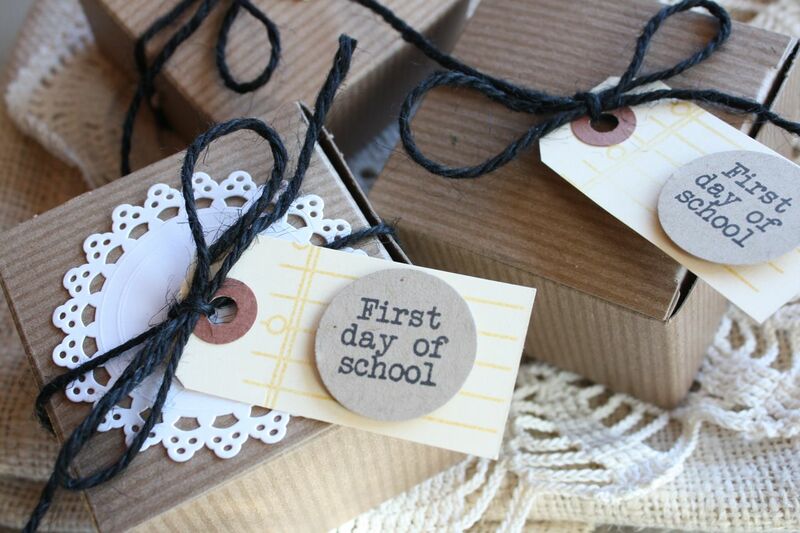 Hey friends, it's the first day of school for my sweet reds. 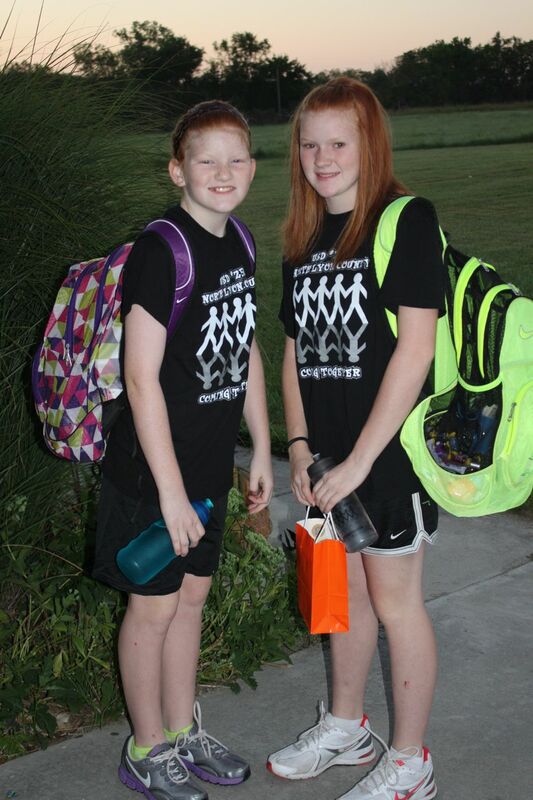 Wow, are they growing up right before my eyes!! New school, new bus route, new friends......I can't wait to hear their day went. As always I do a few back to school gifts for teachers. 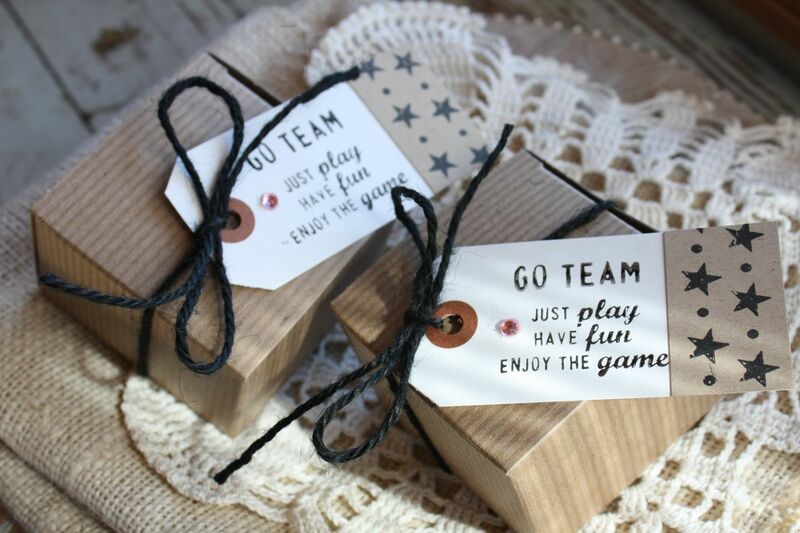 I have some fun new products in my Etsy shop that I'll be using for some fun gift boxes. 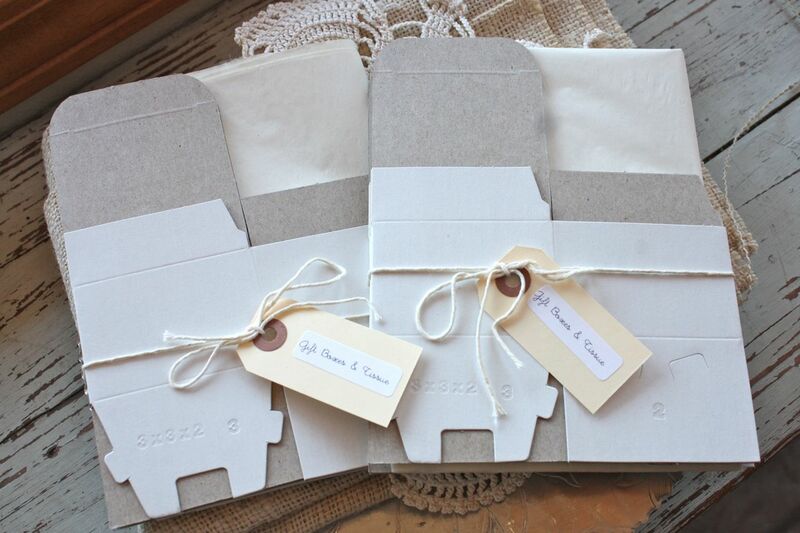 I'm slowly filling my Etsy shop with simple gift packaging products that I think you'll love. I know we're all super duper busy these days with our hustle and bustle life styles but those little gifts and goodies are still important to us, right? Keep it simple, keep it simple......I keep repeating that phrase to myself. And it works. 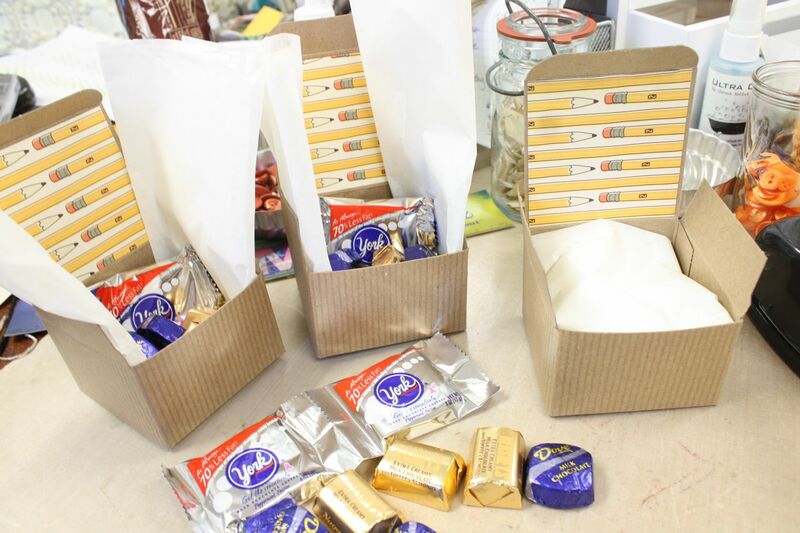 I was able to create back to school gifts in a jiffy. Let me show you what I made. I started out by creating some very simple tags. I used Medium Manila Parcel tags and stamped them with the lined paper image from School Time in yellow ink. I then punched Kraft colored circles and stamped them with another sentiment from SchoolTime. Next up I grabbed some of my new Kraft Gift Boxes with Tissue. 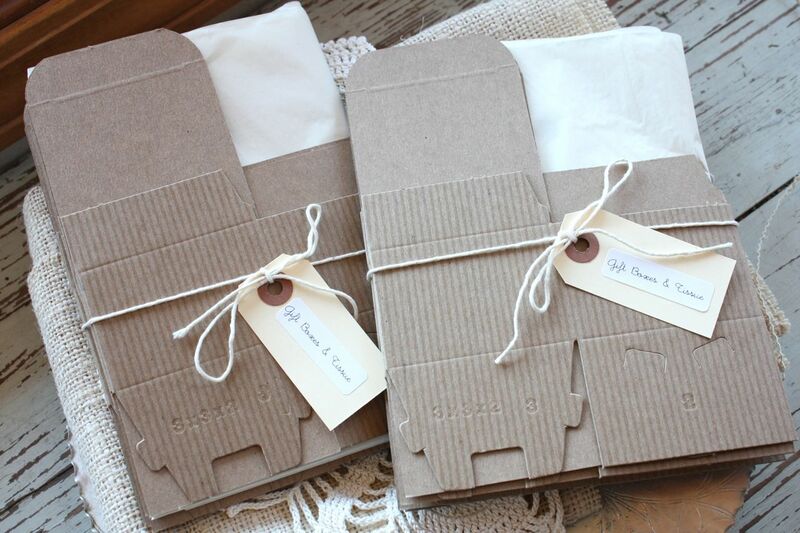 These are packaged in a set of five with five sheets of ivory tissue. 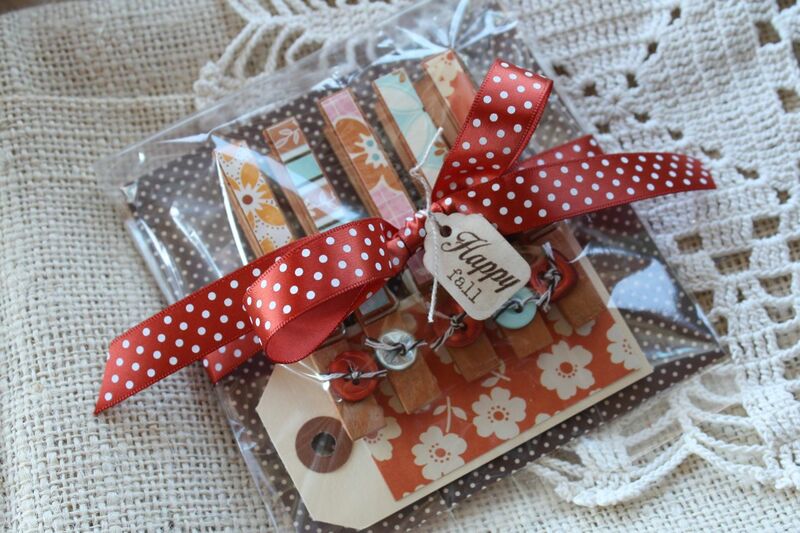 A perfect little item to keep in your gift wrap stash. 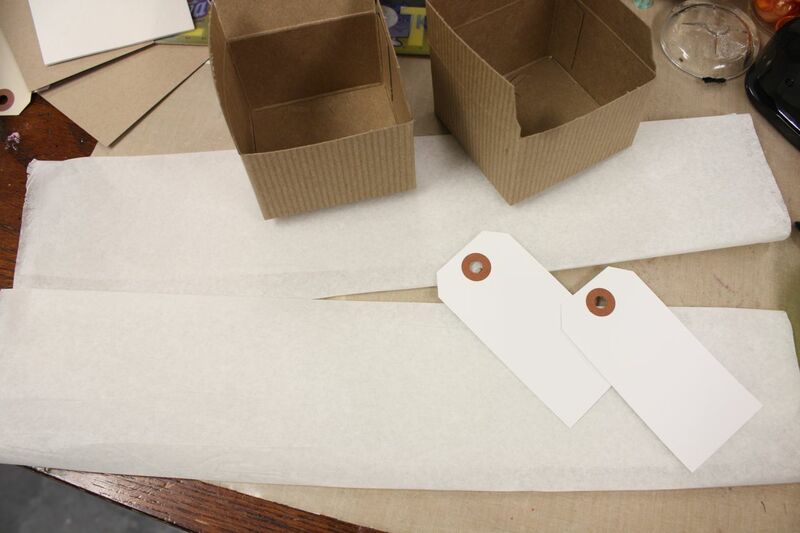 The boxes measure 3 x 3 x 2 and each tissue sheet measures 15 x 20. 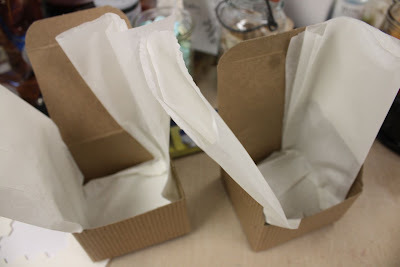 Simply fold the tissue to about 3" wide and line the box...then fill with goodies. 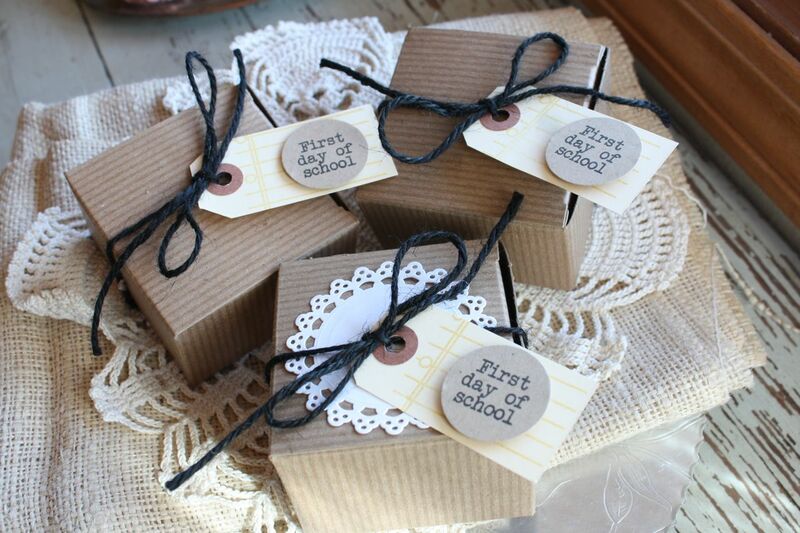 I used various candies as every teacher could use a little chocolate on the first day of school. 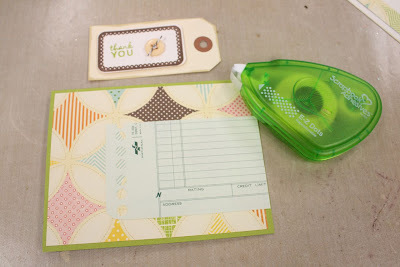 I also lined the inside of the lid with some school themed patterned paper from Cosmo Cricket. Very cute and simple. 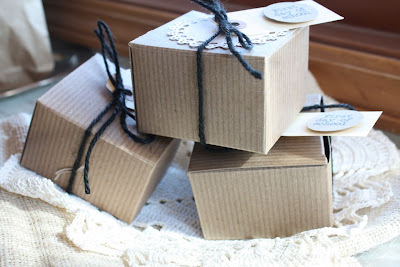 Next, I tucked the lids in and tied my nifty little gift boxes up with my new Black Burlap Twine. The twine is very sturdy and rustic and adds such a nice look to the boxes. I slipped the tags onto the twine before tying the final bow. I added a paper doily to the box of the girls' favorite teacher. So pretty, not too girly......sooooooo simple. I'm loving it! Very nice presentation and it didn't take me all day. In fact, I had some time left over so I made up a few additional gift boxes for the girls' volleyball coaches. You can see my folded up tissue paper...you can cut the tissue in half and still have plenty to line the box. Just push the folded tissue into the bottom of the box and then fill with your goodies. For these boxes, I used my White Parcel Tags and some images from All-Star Team. 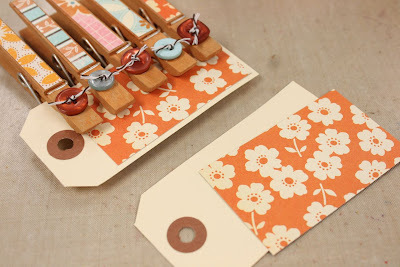 I added some Kraft Cardstock to these tags too, a very nice match. I think the coaches will love these treats. I love to see the gift boxes all lined up. I think they'll be great for little Christmas presents, all stacked up on a vintage silver tray. 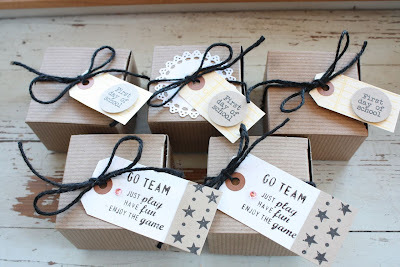 I can't wait to show you more ideas with the Gift Boxes and Tissue! 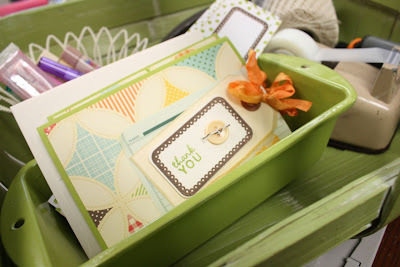 And stay tuned for a post where I show you how to create your very own Gift Wrap Station. Hello friends. Today I have something very fun to show you. I'm introducing my Rustic Clothespins in the color Rusty Pumpkin, the first of many colors to come to my Etsy shop. 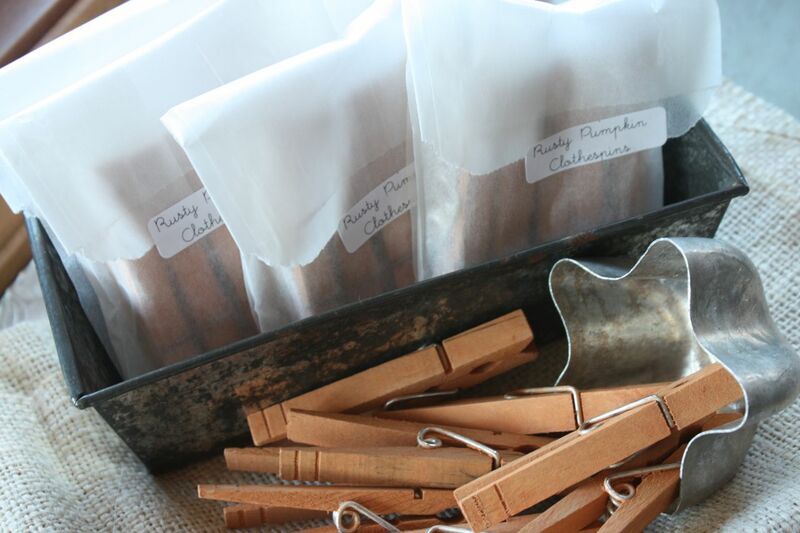 My Rustic Clothespins are hand stained with 100% organic material. It makes me feel so good to know that I'm using a product that is safe for the environment. And as you know, I love clothespins. I think they are the niftiest little invention. Of course I love them for hanging clothes out on my new clothesline (did I tell you I got one? )....but I also love clothespins in my paper crafting world. 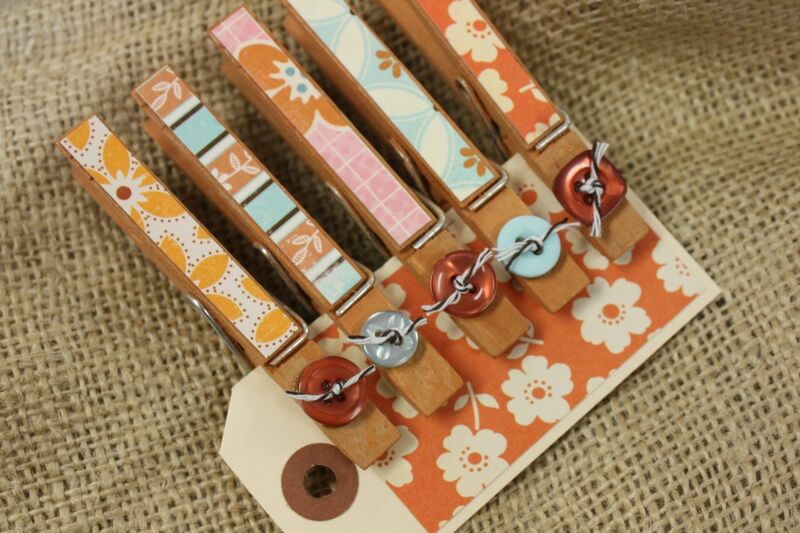 I use clothespins to hold together notes, bills, cards to be mailed, school papers, design team work, etc. 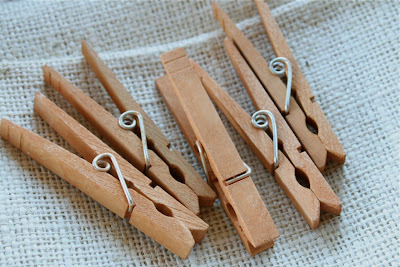 I love that clothespins have been around for such a long time and we still find new uses for them. My hand stained Rustic Clothespins will be sold in sets of 5 for $4.00, a great price to help you make gifts for under $5 bucks. 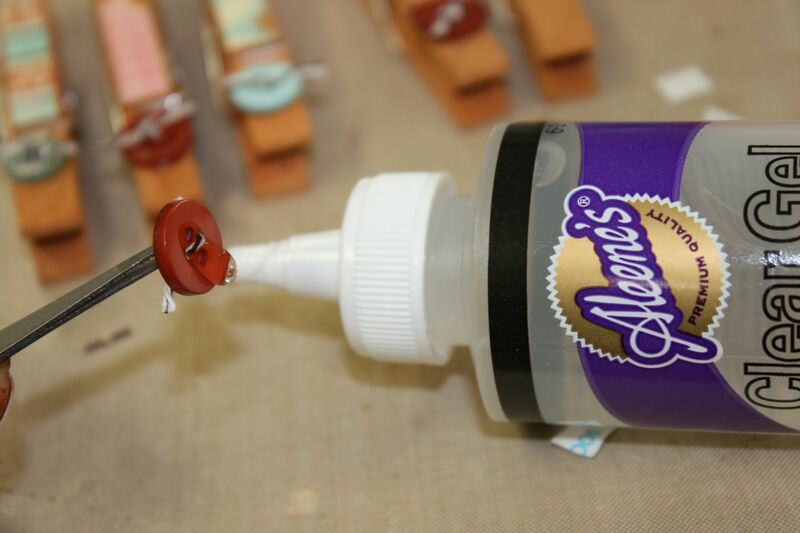 Unlike painted clothespins, the stain I use allows the real wood texture and grain and shiny metal of the clothespins to show through. Very rustic looking indeed. I'll be adding more colors to my Etsy shop in the near future. 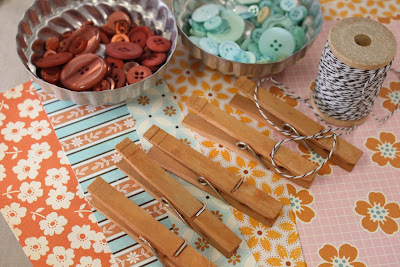 I started with my Rusty Pumpkin Rustic Clothespins because I wanted to be able to use this color for Fall and Halloween projects. How about I show you a little project that will be perfect for gift giving...perfect for teachers and girls would love this. 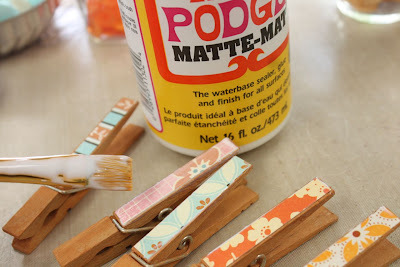 I'm going to be creating some embellished clothespins so let's get started. 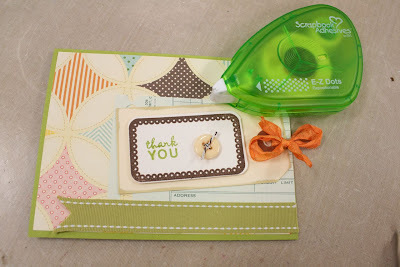 I started by choosing some fun October Afternoon papers that all had some color of orange on them. Love the mixy matchy look but that they're all tied together still. 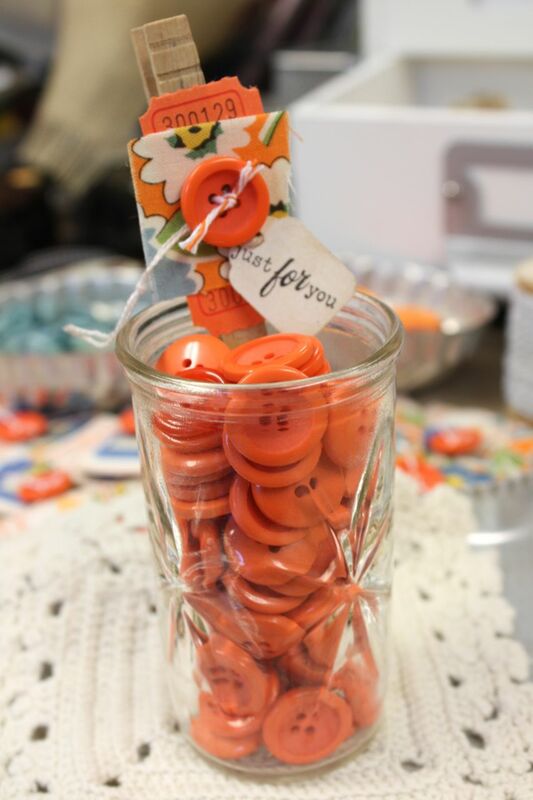 I also picked out some Papertrey Vintage Buttons in Terracotta Tile and Aqua Mist along with some Chocolate Baker's Twine and of course my Rusty Pumpkin Rustic Clothespins. Next up, I cut one each of the patterned papers to measure 5/16" x 2-1/4". I also matched up buttons for each clothespin. 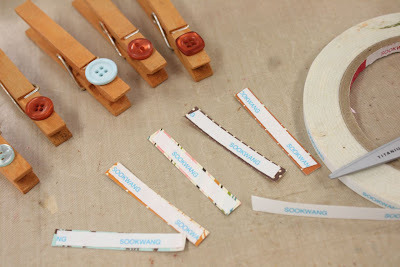 I like to use 1/4" Scor-Tape to adhere the paper to the clothespins. 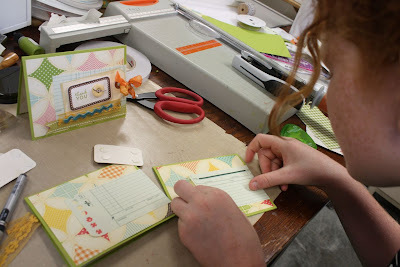 It's not necessary to keep the papers adhered, but a little brushing of Mod Podge will really keep the papers in tact. 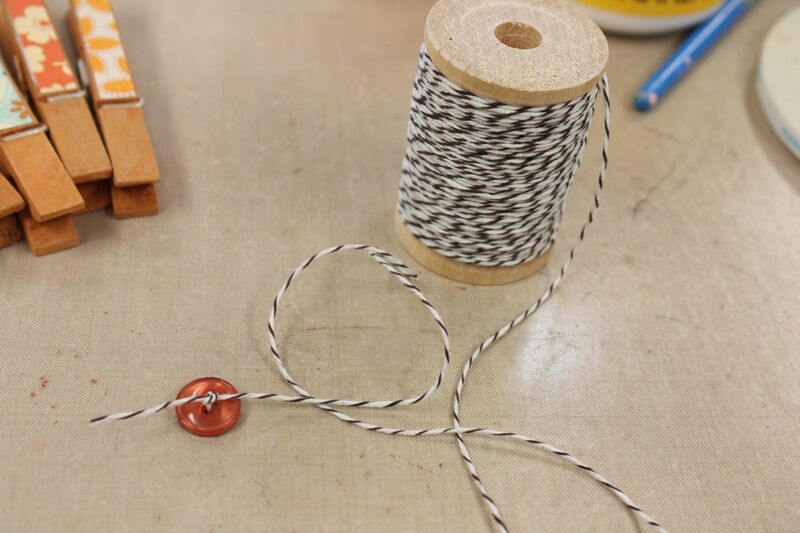 Next up, tie the Vintage Buttons with Chocolate Baker's Twine. A little tip is to tie buttons without cutting the twine off the spool. You'll waste a lot less twine and the long length gives you extra room to work with. 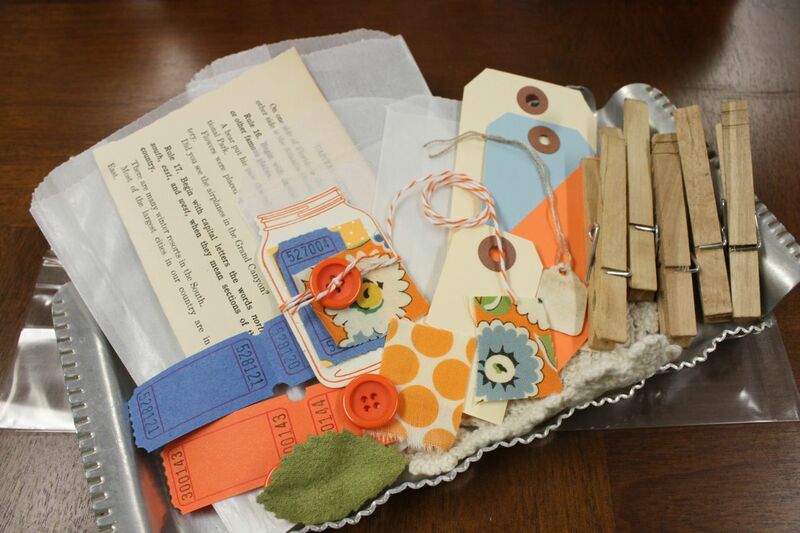 Next, adhere the buttons to the clothespins. 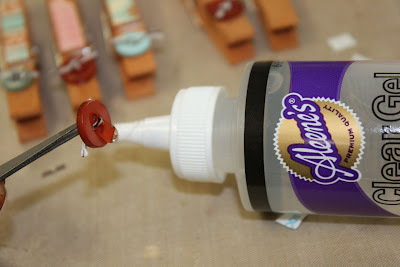 Any craft glue will do, just allow some drying time before packaging up the clothespins. Now it's time for things to get really fancy. Cut a scrap of the October Afternoon paper to fit one of my Medium Manila Parcel Tags. Clip on the embellished clothespins. 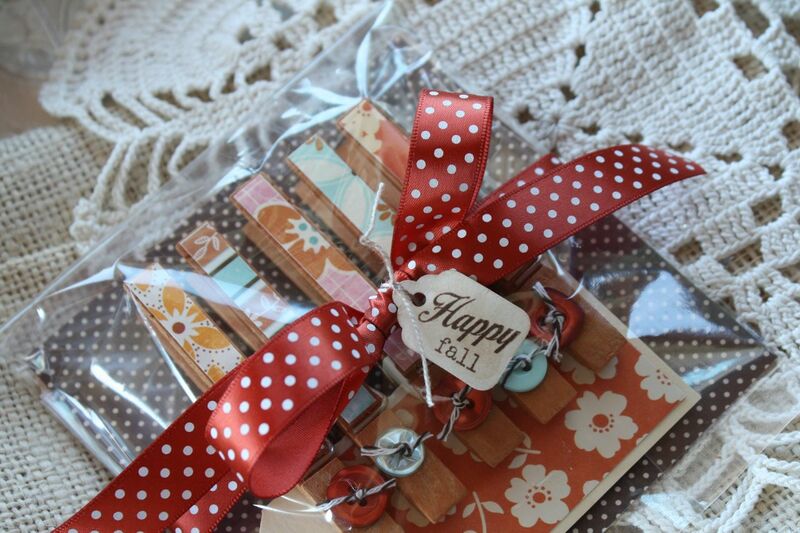 This creates a wonderful base for the clothespin so that they don't slide all around in your package. 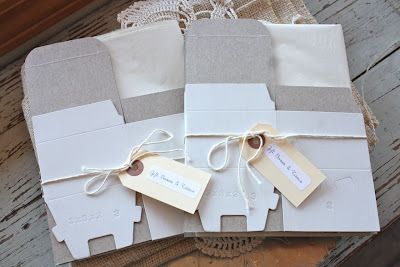 Next up, it's time for my favorite part.....the final gift packaging. Cut another piece of patterned paper to measure 4-3/4" x 4-3/4" square. Slide this into one of my new Large Cello Gusset Bags, now available in my Etsy shop. Fold the bag over and tape to the back with clear tape. Tie on the prettiest ribbon you can find. 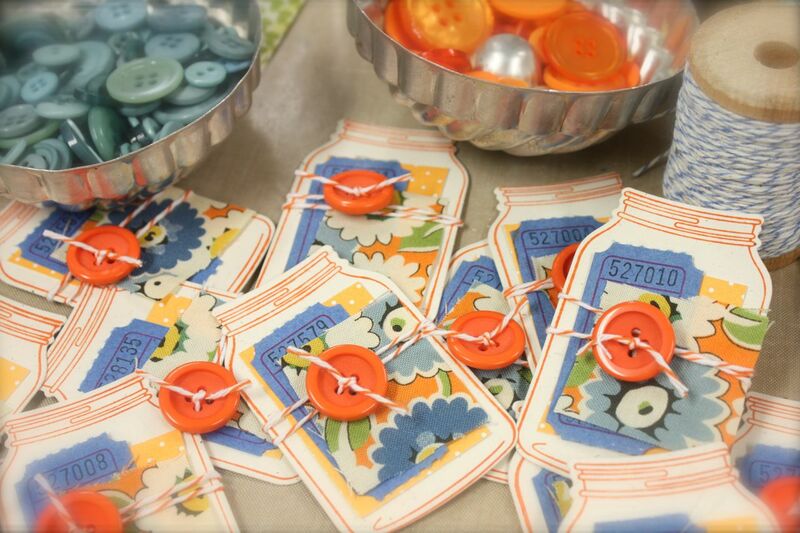 I'm using Papertrey's Swiss Dot Satin Ribbon in Terracotta Tile. 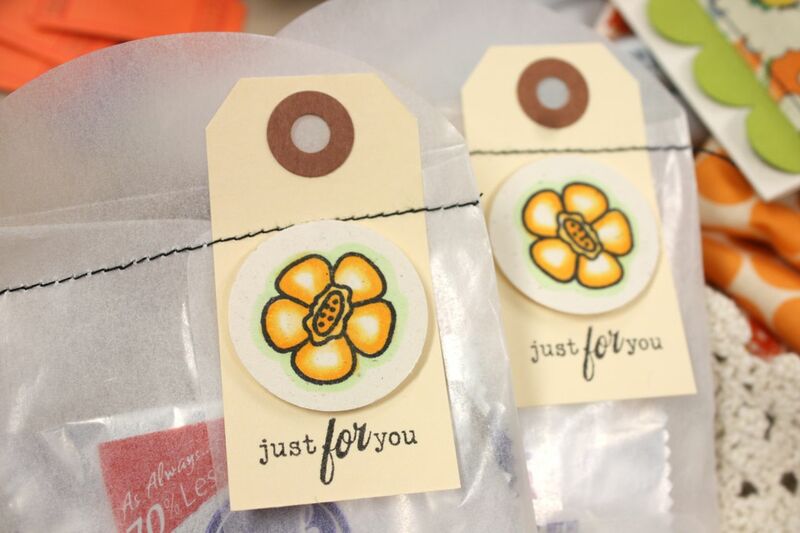 Add the finishing touch by adding a Tiny Tag stamped with a sentiment from Friendship Jar Fall Fillers. The tiny sentiments from this set all fit perfectly on my Tiny Tags. I just did up a new batch of Tiny Tags so there's lots in the shop now. EDIT: The Label Wraps are now available in my Etsy shop. The price is $4.00 for 20 blank, white labels. You can find them here. Hi friends, hope your week is going great! I am back into work mode this week and had some time to work with a few of my new products that will be going up in my Etsy shop soon. Today I am introducing you to my new Label Wraps. 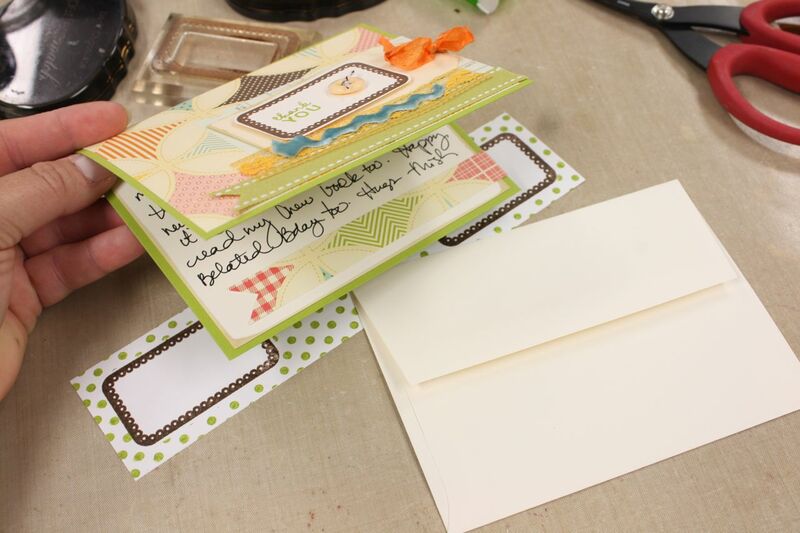 I always think it's so fun to receive a card or parcel that is embellished on the outside as well as the inside. If the outside packaging is nice, you just know the inside is going to be even better, right? Here's a sneak peek of my finished card and envelope with a Label Wrap......but I'd love to show you step by step how I did my project so let's get started. 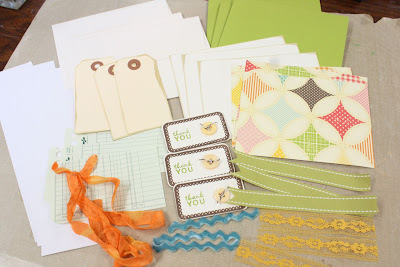 Here's a photo of my supplies that I'll be using including Papertrey Chartreuse cardstock for the card base, Vintage Cream cardstock and A2 envelopes, Vintage Tea Dye Duo ink in Chamomile for distressing, Chartreuse Saddle Stitch Ribbon, Vintage Buttons tied with brown and white baker's twine, Pine's Fillable Frames #7 stamp set with coordinating die cut, old ledger paper, velvet ribbon, buttery vintage lace, Wrinkle Ribbon and Medium Manila Parcel Tags from my Etsy shop and October Afternoon patterned paper. Here we go. 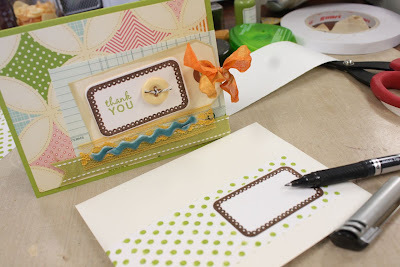 I cut enough supplies to make several cards but I'll show you how to assemble one. To the card front, attach a piece of the October Afternoon cardstock. Add the piece of old ledger paper. Assemble the tag by distressing edges with Tea Dye ink, die cutting and stamping the label and adding the tied button with a mini glue dot. Attach the parcel tag to the card front. Punch a hole through the tag and card front and tie on the snippet of Wrinkle Ribbon. Notch one end of the Chartreuse ribbon and attach to card front, just below the parcel tag. I use Scor-Tape to adhere my flat ribbons. Next up, attach the buttery lace and velvet ribbon pieces to the card front using a stapler. 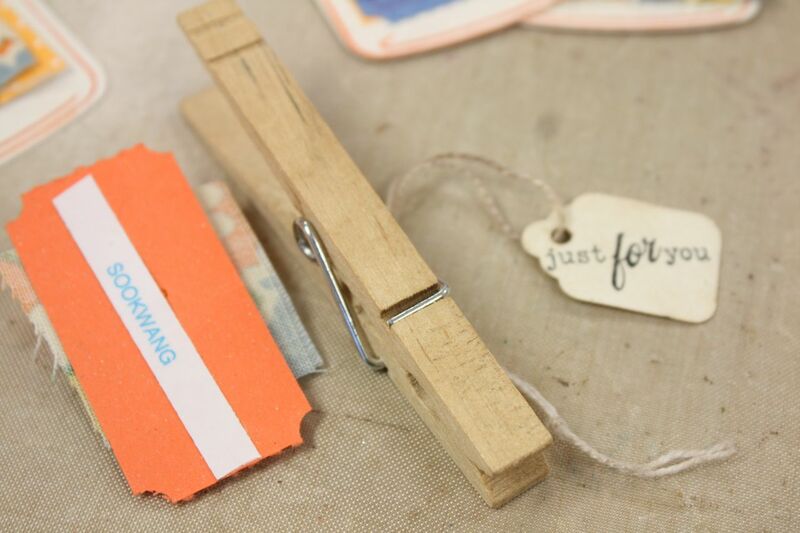 You can use a regular stapler but I love my Tiny Tim stapler (Tim Holtz's mini stapler). The staples go through the entire card front and will show on the inside of the card. That's okay. I use a small craft hammer to flatten the staples on the back side just to make sure there are no pokey edges. Your card front is now done. 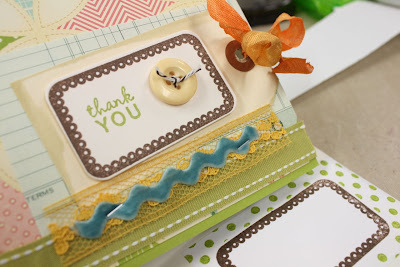 Lots of fun layers that add nice dimension to the card. I like to embellish the inside of the cards too. People will really freak out with they see this added touch. They will be impressed! 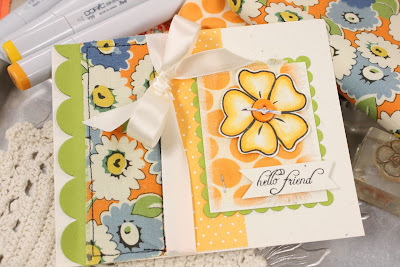 Here, I added another piece of Vintage Cream cardstock along with a notched strip of the October Afternoon patterned paper. Now for the new, exciting part! 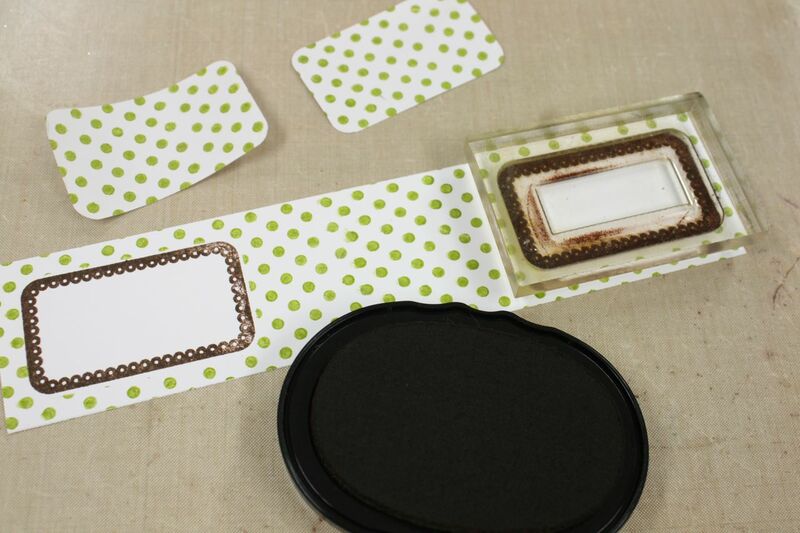 I'm going to show you how to use my Label Wraps. The Label Wraps are like giant address labels that are intended to wrap around envelopes. On the front of the envelope you write the recipient's address on the label space that you create and on the back you write your return address on the label space you create. Here's how you do it. 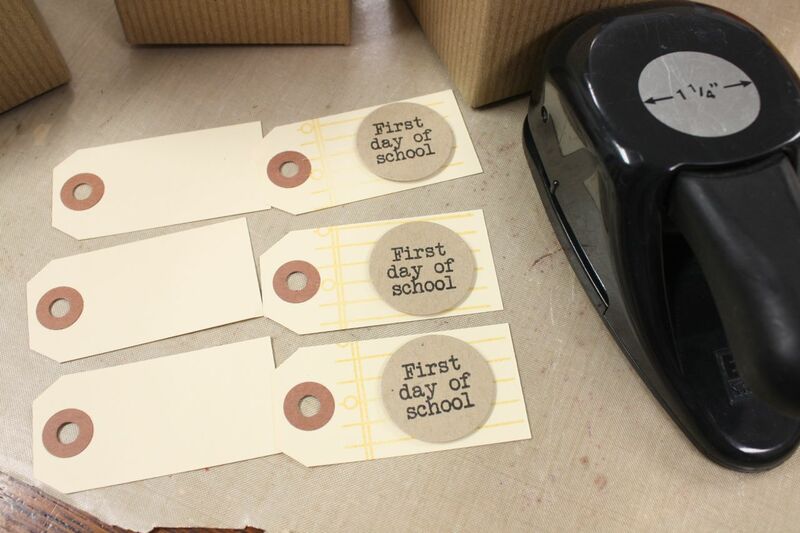 Using a Label Wrap, mask off two die cut labels. I'm using the Fillable Frames #7 label die that I cut with Eclipse masking tape. You can see both of those label pieces on the white blank Label Wrap below. Place one die cut label mask at each end a Label Wrap. 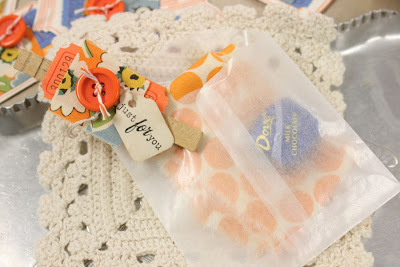 The polka dot Label Wrap is completed so you can get a visual. Note: You can use any of the Fillable Frames labels with my Label Wraps. I can't wait to try more. 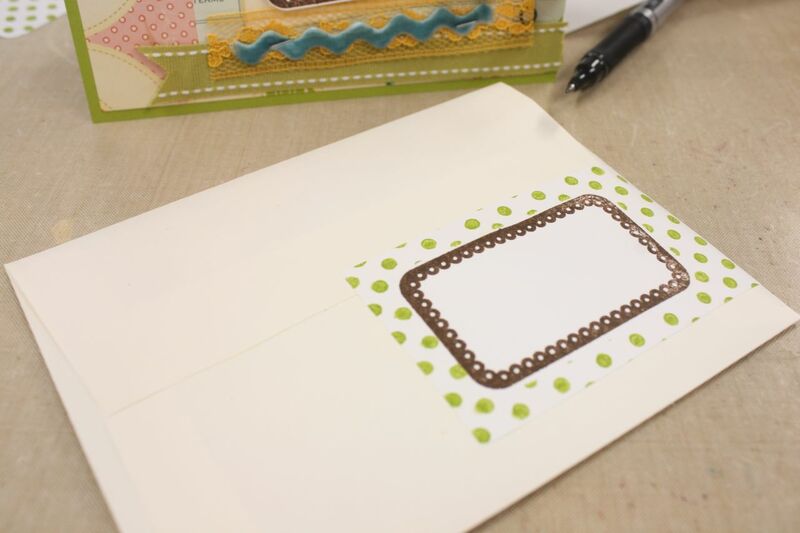 Once the masked labels are placed on the Label Wrap, stamp the desired design over the entire Label Wrap. 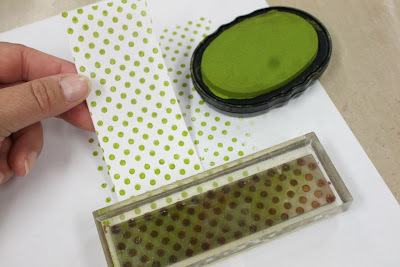 I used Polka Dot Basics in Chartreuse ink. 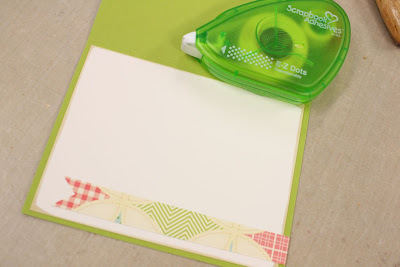 Once the ink is completely dry, peel off the label masks. Then stamp on the coordinating label stamp from Fillable Frames #7 with Dark Chocolate ink. I love this customized look. You can use any label images, any background you wish and any color combinations. The possibilities will be endless. 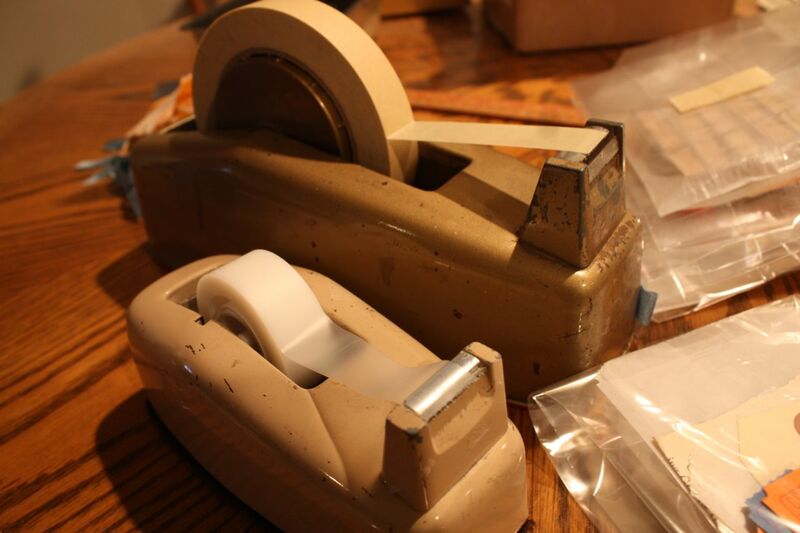 The Label Wraps are white but can be distressed, brayered, painted, stamped...you name it. 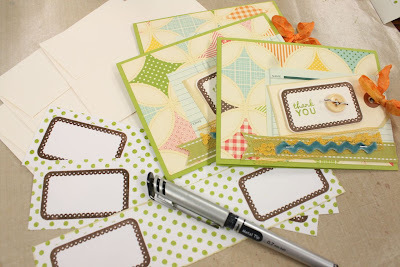 And think how these would look on Kraft colored envelopes or colored envelopes. Love! 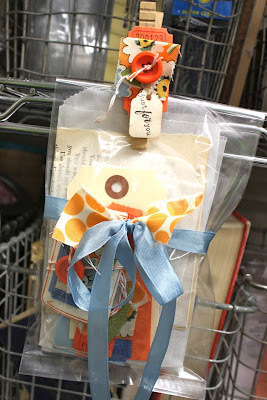 So now that the Label Wrap is all stamped, I have a pretty card, coordinating Label Wrap and a Vintage Cream envelope. Oh how I love to see this little ensemble. Lots of detail on every little element. 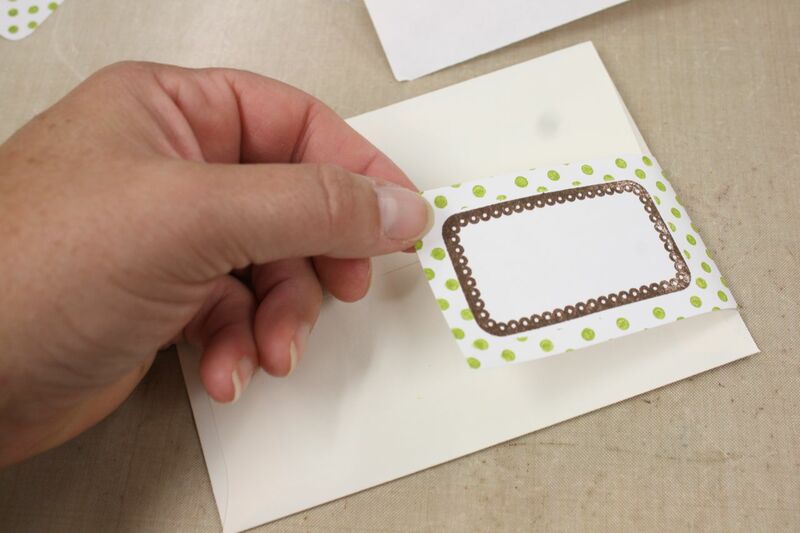 You will want to keep your Label Wrap in tact until you are ready to insert the card into the envelope. This is because the label wraps around the back of the card and goes over the back flap of the envelope. 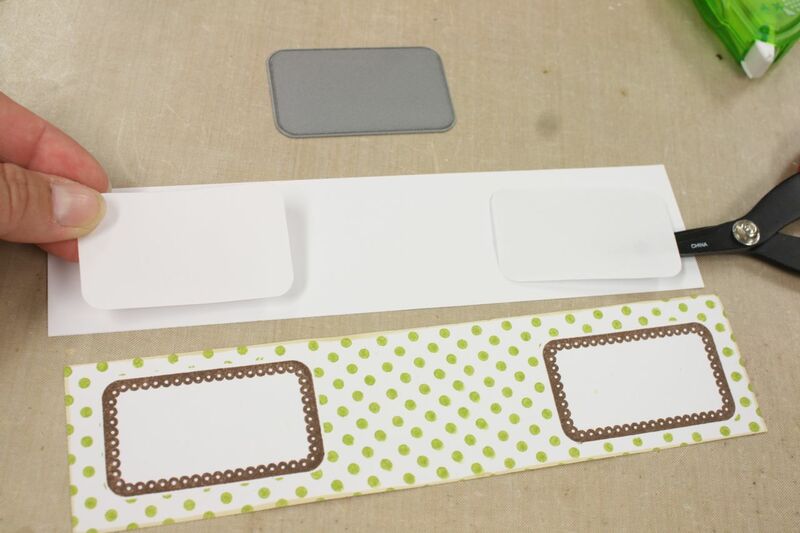 Here's the front view of the Label Wrap being placed on the envelope. Then you turn your envelope over and it wraps onto the back side....over the sealed envelope flap. Jordy helped me make a few extra cards for my stash. She's such a good helper. Be sure to let the kiddos join in on the fun. Here's my finished card again shown with a card that is sealed up and ready to go in it's Label Wrapped envelope. So fun, don't you think? And here's the back side again. Very clean and simple and totally okay to send in the mail. Here's a little closeup of the front of the card. Love the look of the label on the parcel tag. And here's my little stashola of card, envelopes and Label Wraps. Oh, come to mama, I do love a stash of cards. 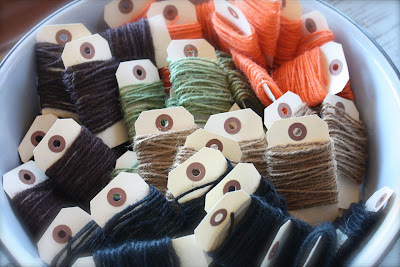 Just store your little bundles in a little tin or basket until you're ready to use them. 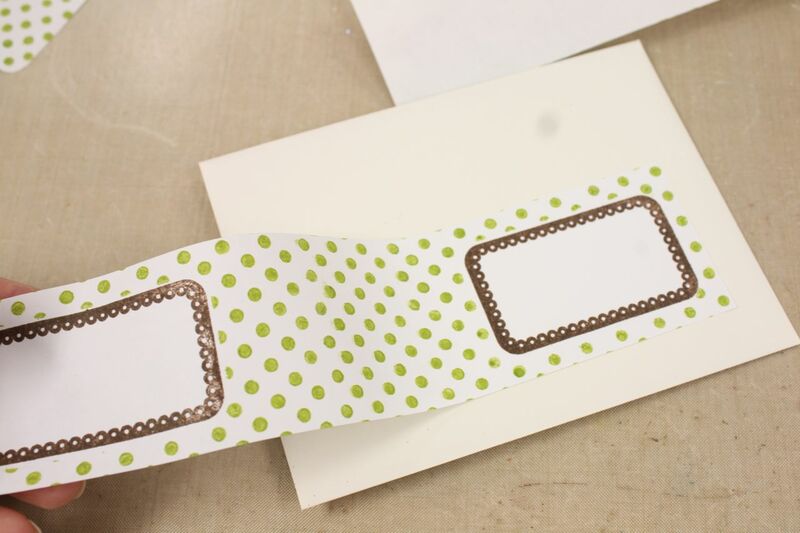 Remember.....the Label Wraps have to be adhered after you seal up your envelope. I hope you enjoy my new Label Wraps. Stay tuned for more ideas using the Label Wraps on new packaging items coming soon.